I thought that my daughter might not accept this dish, because it’s used fermented red beancurd that not many people like it. Finally, I'm glad that I was wrong. She ate almost half of the dish with a big bowl of rice. Well, I myself like the colour, taste and smell of fermented beancurd as I’ve grown up with eating all traditional Chinese dishes cooked with this special condiment. On the Chinese New Year day, my mum used to cook a vegan dish mainly used it. When it comes to using this distinct condiment, it's better to mash it into paste first, then let it be cooked in some heated oil and release the aroma. Both of its taste and aroma would penetrate into the meat after cooking. This spicy beancurb pork rib stew was so wonderfully good to go with steamed rice for dinner. 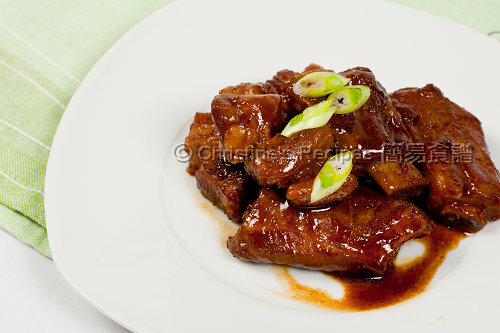 Rinse pork ribs and cut them into chunks, stir in marinade and leave for a while, then fry briefly in hot oil. Put aside. Heat oil to saute ginger, spring onion and mashed fermented red beancurd, put in ribs and splash wine. Saute well and transfer ingredients to an earthen pot. Put seasoning and star anise into ingredients and bring it to boil. Then, simmer with medium-low heat till ingredients are tender and sauce thickens. Serve hot. Totally agree about the special flavour of the fermented bean curd. It enhances the taste of the dish. I don't mind having some of the ribs! Yum! 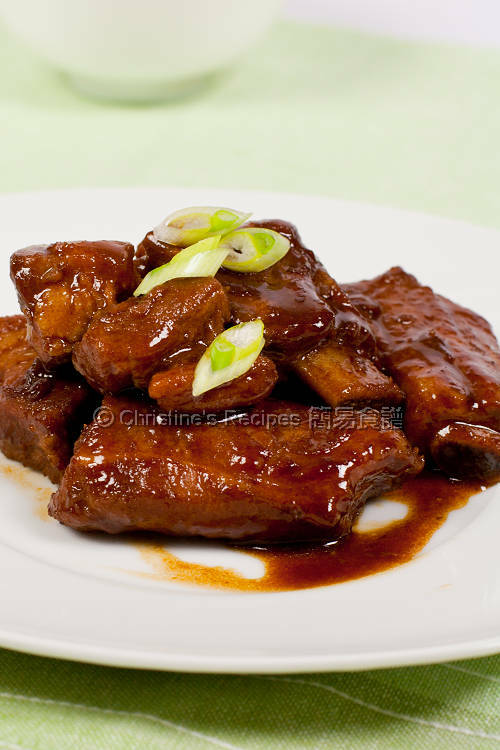 I have heard that fermented red beancurd is good stuff but I have never bought any to incorporate in my cooking. I do use that brand of fermented beancurd at times! Can I just use my wok to stew the ribs? I don't have any earthen pot. This dish can be done in a wok, without any earthen pot. Just keep the heat as low as you can, stew the pork until really soft, and replenish water if necessary. This looks mouthwatering! I just have some white fermented tofu in the fridge....;-( I guess the beautiful shiny colour comes from the red fermented tofu, right? Mouthwatering is right. This just looks amazing. this looks very delicious, so nice to go with a bowl of rice :). 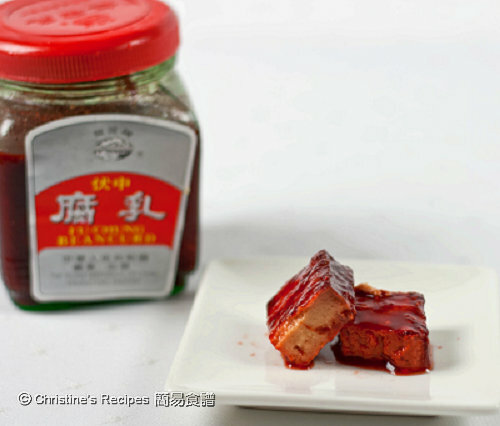 Love cooking with red fermented beancurd too, so flavourful! Looking forward to try out your fabulous recipe.Thanks alot.